You'll enjoy Michigan snowboarding more if you take the time to plan a safe outing. Play it safe by being in shape and having the proper equipment. Just like skiing, nothing ruins a great winter getaway like an injury. This is one of the most popular couples winter activities in the state. The spectacular resorts make for an unforgetable romantic winter weekend or vacation. Check out Michigan's winter resorts for your snowboarding adventure. Many of the resorts and lodges will have equipment available to rent. This makes it nice if you don't want to drag your own equipment around. If your going to borrow a friends board and equipment be sure you are the same size. People who have their own snowboarding equipment buy it to fit them. Equipment that doesn't fit or can't be adjusted to fit could be dangerous to use. Wrist injuries are the most common when snowboarding. It's only natural to reach out to break your fall. 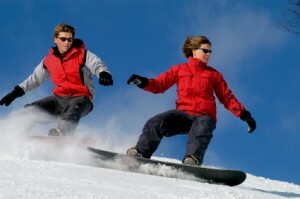 Here are a few tips to help you enjoy your snowboarding experience safely. Be sure your equipment fits properly and it's in good shape. 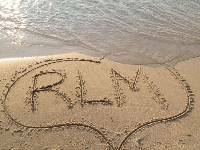 If you are renting it at the resort they will help you get it right. If you are buying a snowboard your size determines the board you'll need. Width and length are determined by your hieght and weight. The type of use also determines the style of board you'll want. Stay in shape. Take the time to stretch before hitting the powder. Wear the safety equipment! Helmets and wrist guards should be standard for you. Stay in your comfort zone. Pick the runs based on your experience. Snowboarding the Michigan hills and runs are a great way to enjoy the winter together. Afterwords a cup of hot chocolate is a good finish to your fun day on the powder. If you don't want to pay the big money resorts often charge, check out ourplaces to stay page and click on the table of cities for hotel savings.